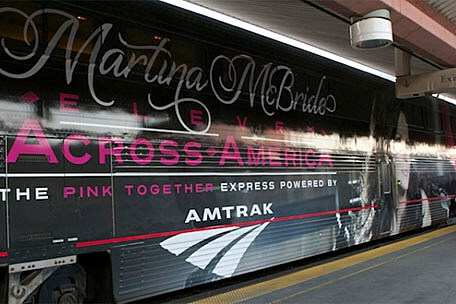 Martina McBride wraps up her Eleven Across America whistle stop train tour today. The four-day, 11-city trek on the Amtrak Pink Express quickly became a multimedia extravaganza, with personal videos, hilarious tweets and detailed blog entries from the country superstar. See a photo gallery of Martina&apos;s trip! 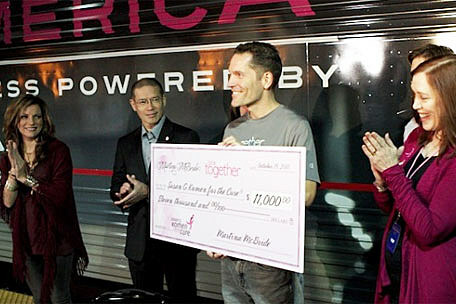 An introductory ceremony at Los Angeles' Union Station included a presentation from Amtrak's Chief Marketing Officer David Lim, along with several breast cancer survivors, and, of course, Martina herself. Chicago's US99 radio reportsthat at each stop along the way, survivors and those affected by breast cancer are asked to step forward and sign the train, which will be on display at the end of the journey. Although Martina's usual routine during the week she releases a new album is to do television appearances and a couple of in-store events, she says that can be limiting. "You're really bound, geographically," Martina told The Boot in our exclusive interview. "You can only get to so many places in a week. The idea of going to the West Coast, all across America to the East Coast in one week, and getting to stop and visit with the fans and play them some of the music just really excited me." As of last night (Oct. 12), the Pink Express will have stopped in L.A., Flagstaff, Ariz., Albuquerque, Newton, Kan., Kansas City, Mo., Chicago and Cleveland. Stops to come include Pittsburgh, Washington, D.C., and Philadelphia. The trip ends in New York City, where the singer will become the first country artist ever to perform atop the Empire State Building. She'll also take part in a ceremony to light up the building in pink, in her continuing effort to raise breast cancer awareness. -- "I am sitting in my room on the train. Let me tell you about my journey so far. We had a friend's wedding yesterday evening and left the reception around 9:30 PM to catch a plane to fly to LA. (to catch a train! Literally, planes, trains, and...well, you know the rest)." -- "Good morning! Waking upon a train is so cool!!!" -- "Had donuts delivered (you know, the mom in me worries about everyone being fed! If I had my way, we would have delivered eggs, bacon, and waffles....but donuts had to do!)" -- "Over 600 folks showed up for the performance around 2:15 AM at the station in Albuquerque!" -- "I'm coming home to KS! Stop #4 ... NEWTON, KS!" Tuesday (Oct. 11) marked the release of Martina's 11th studio album. Also available now, exclusively at Target stores and Target.com, is a deluxe version of 'Eleven,' which features four bonus tracks: 'You're in My House Now,' 'Closing Time,' 'Ask the Boy,' and 'I Give It to You,' along with the 'Teenage Daughters' music video and videos from the in-studio recording of 'Teenage Daughters' and Martina's powerful new single, 'I'm Gonna Love You Through It,' the story of a woman battling breast cancer. Keep track of Martina's train trip progress at her Eleven Across America blog and her official Twitter page.